GARDAÍ IN LIMERICK arrested a youth for driving a scrambler bike on a footpath near pre-match rugby crowds on St. Stephen’s Day. The young person was spotted by a Garda cyclist in the Thomondgate area of the city and was arrested for driving offences. A Garda spokesperson told TheJournal.ie that the boy, in his teens, was arrested at 4.15pm for dangerous driving. The spokesperson added that “there were a lot of people in the area at the time” for the Munster rugby game against Leinster at Thomond Park. The Gardaí detailed the case on their twitter account with the warning “Use presents properly”. Numerous warnings were issued ahead of the Christmas period, with the Road Safety Authority and South Dublin County Council among those joining the Gardaí to warn parents about the dangers of buying these bikes as gifts for their children. They pointed out that quad bikes and small motorbikes are only allowed to be used on private land and are illegal to be driven on Irish roads. Anyone who drives a quad or mini-bike must: be over 16, wear a helmet, hold a valid driving license and have the appropriate tax and insurance. Selling such a vehicle to someone under the age of 16 could yield a fine of up to €3,000 or six months in prison. At the time, Councillor Deirdre O’Donovan said: “Scramblers and quad bikes are an issue that communities have been struggling with for a number of years. We need to educate parents of the dangers of their children using these bikes. We have had too many tragedies and parents need to be aware of the legal responsibilities especially as we approach Christmas. 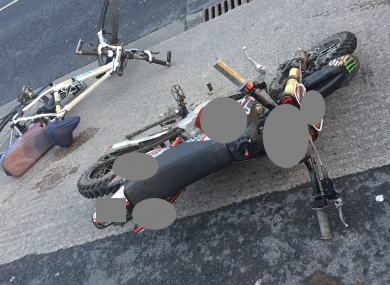 Assistant Commissioner Michael Finn said: “We cannot emphasise enough that these are not toys – they are powerful MPVs and in inexperienced hands or on unsuitable terrain they have the potential to severely or even fatally injure someone.“That is why they are unsuitable for children. The last thing anyone wants is a tragedy, especially at Christmas, involving one of these motor vehicles. Email “Limerick teen arrested for driving scrambler on footpath on St Stephen's day”. Feedback on “Limerick teen arrested for driving scrambler on footpath on St Stephen's day”.